Rescue helicopter and coastguard are involved in the search for 49-year-old man. 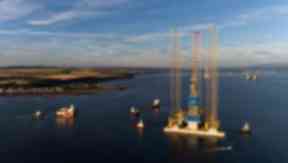 A North Sea oil worker has been reported missing from a rig. Police have launched a search for the 49-year-old man who had been working on the Noble Lloyd Noble installation. The alarm was raised around 9.20pm on Tuesday after he could not be located on board the jack-up rig in the Mariner Field, approximately 90 miles east of Shetland. Emergency services are searching for him, with a rescue helicopter, coastguard and supply vessels for the platform all involved alongside police. Inspector Steve McEwan said: “An extensive search of the rig itself and the water surrounding it is ongoing, led by the Maritime and Coastguard Agency. A search mission is underway in the North Sea after a man was reported missing from a rig. The alarm was raised at around 9.20pm yesterday when the 49-year-old couldn’t be found on board the Noble Lloyd Noble installation. He had been working on the rig, operated by Statoil, located about 90 miles east of Shetland in the Mariner Field. Police Scotland was called following initial searches of the installation. A coastguard helicopter, two standby vessels and a platform supply vessel are all involved in the operation. Noble Lloyd Noble is one of the world’s largest jack-up rigs, an installation with long support legs which can lower to the sea floor.